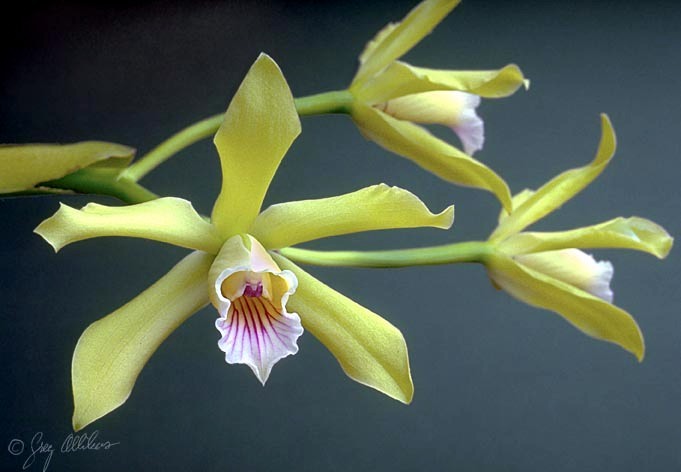 Laelia (pronounced (lay-LEE-uh) was formerly a large genus that included species in Mexico and Brazil. With the publication of Genera Orchidacearum Vol. 5 in 2009 the Brazilian laelias were moved into an expanded concept ofCattleya based upon DNA evidence. Laelia species currently number 24 and include some formely included in Schomburgkia. It is not certain what “Laelia” means, but it seems that Lindley gave the genus the name of one of the Vestal Virgins from Greek Mythology, referring to their beauty. Three of the former sections occur in Mexico (and share many structural features) while the majority of species, occur in Brazil. Many of the Mexican species (Laelia anceps, for example), grow in dry areas where the plants are subject to very low temperatures and even frost, and so they should be grown cooler for their best development. The Brazilian species can be found from sea level up into the mountains, so their growing conditions vary from very warm to cool depending on the particular species. The type species isLaelia speciosa, a Mexican species with compact plants and very showy large flowers. Laelia purpurata, now Cattleya purpurata, the Brazilian national flower. The former section Parviflorae, the so-called “Rupiculous laelias” from Brazil, includes more than 35+ species. This section is in the genus Cattleya as recognized by the World Checklist of Selected Plant Families but some taxonomists classify them as Hoffmannseggella. Number of species: 23 in the strictest definition of the genus and around 70 in the broadest sense. Color forms number the hundreds. It should be noted that there is currently great debate regarding which species should actually be included in this genus. The World Monocot Checklist currently recognizes only 23 species; the “rupiculous laelias” and those of section Cattleyodes having been moved to Sophronitis(see above). In addition, many former Schomburgkia species have been moved to Myrmecophila and the remaining species transfered to Laelia. Reprinted from AOS with permission.